My stay here was great! The beds were very comfortable. There was a lot of construction going on outside, so it woke us up early in the morning, but there was nothing the hostel could do about that. 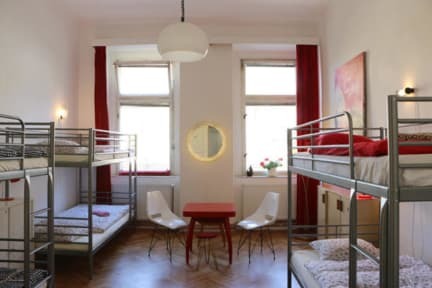 The hostel is close to the bus and tram, so it is easy to get around Prague. Lovely hostel with nice people! The building looks kinda bad on the outside but inside it's great. And that's what counts 🌈 . There are two restaurants, one downstairs and the other across the street, with excellent food at very good prices. Nice staff with good recommendations. The whole hostel is just one floor, so it's pretty cozy and easy to chat with other travelers. FYI for light sleepers: on Saturday night it was a little loud outside. But I slept okay. 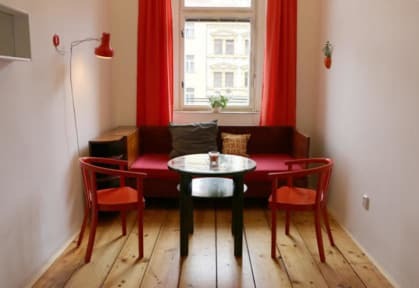 Despite problems with the lights in one of the bathrooms due to renovations and weak internet connection, hostel lipa has been one of my favourite places to stay throughout Europe! Beautifully decorated with an inviting living space to meet and talk with others. It’s small so you run into the same people all the time and can really get to know everyone. The kitchen is well equipped; never felt overcrowded. Staff are great! Just beware the limited reception times if you arrive early or late. It was an overall pleasant stay, however there was construction work going on on the street and there was a lot of noise. This isn’t the hostels fault however so it’s just something to keep in mind! Bring earplugs! The hostel was clean and tidy with interesting decor. Our double room was spacious with the bed located on a mezzanine in the room. The location was good for us, about a 30 min walk to the centre of old town but with good cafes and restaurants within its own smaller district. Not much social interaction with other guests. Nice to be able to spend some time in a less touristy part of Prague. Would definitely stay again! cute and artsy hostel! enjoyed our stay for one night. the staff is really kind and helpful. would come back for sure! When arriving we noticed that the whole road outside the hostel is in major construction, so it was pretty noisy with workmen from early hours. The kitchen was well equipped. No aircon but we were given multiple fans. Quite a walk from the center - but walking through the park behind the hostel was a much nicer way to get to the city. However hostel was small so not much of an atmosphere. We stayed 5 nights at this hostel. Staff were quite unfriendly in welcoming us when we checked in and were absent on an evening if you needed anything. We couldn’t get through to the other hostel either. There is a lot of exposed wiring in the building the hostel is in and in the entrance of the hostel which doesn’t seem very safe. Lockers are pretty small, the location is in a rougher part of town and we found cockroaches in the room. However good facilities and value for money. We checked in at the other sister hostel as we arrived late in the night but were given poor instructions as to finding the this hostel and did not have a guide as promised in the email. This resulted in us being lost in an unsettling environment. The entrance to the hostel was surrounded by loose hanging wires and was poorly lit. We found many cockcroaches in the bedroom including some in the beds which lead to many poor nights sleep. Overall we felt very unsafe In and around the hostel.